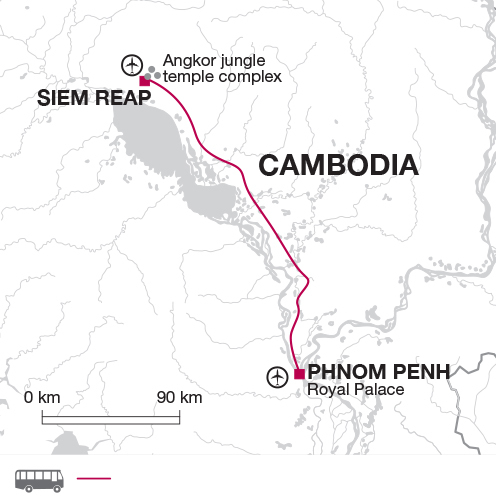 Our Cambodia Highlights trip spends one week exploring this fascinating country's highlights and traveling on a variety of transport along the way. In Phnom Penh we travel by cyclo-rickshaw, a more sustainable way to explore the city that doesn’t contribute to city pollution and provides local employment opportunities. In Siem Reap we explore many of the temples on foot, and on Tonle Sap lake we visit fishing communities by longtail boat which offers a traditional and low-impact way to explore and provides employment to the local boat drivers and crew. We manage water consumption and reduce waste on this trip by encouraging people to bring along re-usable bottles and by supplying a large tank of fresh drinking water on our coach, available for refills. Conscious of our impact on the environment, by opting to travel most journeys on public trains we are drastically reducing the reliance on privately chartered transport within this trip. All travel has impacts, but we are confident this trip keeps those to a minimum. Train travel is also a great way to meet local people and get a more personal experience of travel in their country. This is an excellent opportunity to get chatting, so we do encourage you to try a few words of Spanish! Ensuring that local people benefit from tourism is core to our philosophy and relevant to all countries, regardless of the level of development. Though you will need to drink plenty on this trip, we encourage you not to buy bottled water due to the plastic waste this generates. Tap water is perfectly drinkable in this area so bring your own reusable water bottle with you. We use locally owned transport and hotels for the majority of the time and try to spread our custom to a variety of local restaurants and attractions. It’s not just good for the local communities; we believe you get a better experience as a result. One reason we use local tour leaders is so they can help bridge any cultural gaps between us and the local people. As well as helping to unlock many aspects of the destination; employing a local tour leader, local guides, drivers, and boat crews all contributes in supporting the local community through employment and training. Our supplier is a locally owned company and over the past 25 years we have built a long standing, mutually beneficial and respectful relationship.